The Logan County Area Chamber of Commerce would like to recognize Holdren Brothers Inc. as July's Chamber Business/Entrepreneur of the Month. Holdren Brothers Inc. has been serving Logan County for 73 years. In 1939, brothers, Donald and Raymond Holdren started the welding and machine shop business. During World War II the welding and machine repair was headed by Raymond. Sub contract machine work for the war was headed by Donald. In 1946 James, the third brother, joined the business after serving in the US Navy. 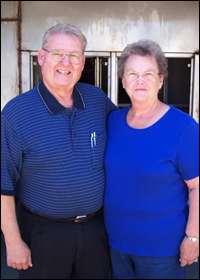 After the passing of brothers Donald, Raymond and James; John and his wife Shirley took over the business, as president and vice president respectively. Their son Steven, and grandson, Johnathan also work for the family business. Holdren Brothers, Inc. currently manufacturers a large variety of stainless steel spray devices used in cleaning automatic systems for food and beverage equipment, cleaning systems for automatic equipment in the dairy industry, plastic parts, and silo dig-out tools. In the past they have manufactured buck rakes, bale chutes, power unlading equipment for hay, wagon chassis, steel beds, can racks for milk houses, hi-lifts, and engine stands. Did you also know the holder for the Logan County Bicentennial Bell was made by Holdren Brothers, Inc.? When asked why they chose to be a member of the Logan County Area Chamber of Commerce, John states, "We joined the Chamber because there would be a lot of other business people involved that could lead to business contacts for people who could use our services and we could use their services as well." Please join the Logan County Area Chamber of Commerce in thanking Holdren Brothers, Inc. for their longstanding support of Logan County business and industry.